In Freud's psychoanalytic theory of personality, the unconscious mind is a reservoir of feelings, thoughts, urges, and memories that outside of our conscious awareness. Most of the contents of the unconscious are unacceptable or unpleasant, such as feelings of pain, anxiety, or conflict. According to Freud, the unconscious continues to influence our behavior and experience even though we are unaware of these underlying influences. 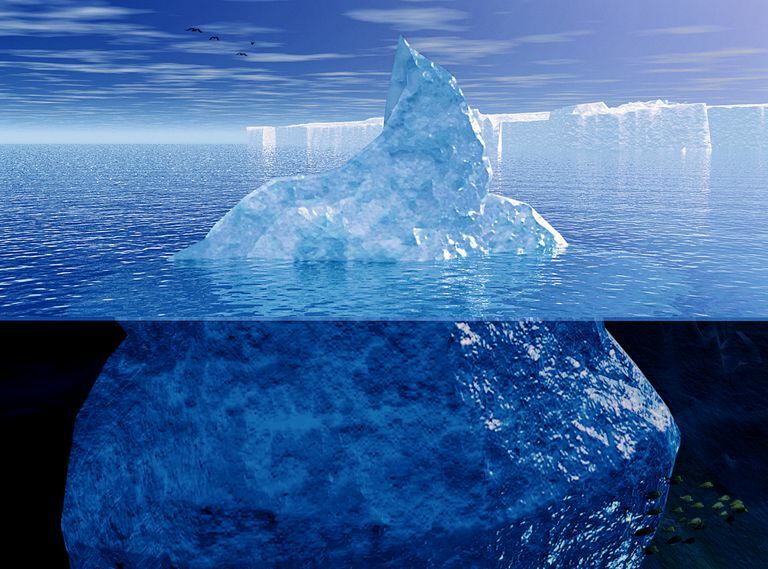 When thinking of the unconscious mind, it can be helpful to compare the mind to an iceberg. Everything above the water represents conscious awareness while everything below the water represents the unconscious. Consider how an iceberg would look if you could see it in its entirety. Only a small part of the iceberg is actually visible above the water. What you cannot see from the surface is the enormous amount of ice that makes up the bulk of the iceberg, submerged deep below in the water. The things that represent our conscious awareness are simply "the tip of the iceberg." The rest of the information that is outside of conscious awareness lies below the surface. While this information might not be accessible consciously, it still exerts an influence over current behavior. Freud believed that many of our feelings, desires, and emotions are repressed or held out of awareness. Why? Because, he suggested, they were simply too threatening. Freud believed that sometimes these hidden desires and wishes make themselves known through dreams and slips of the tongue (aka "Freudian slips"). Freud believed that all of our basic instincts and urges were also contained in the unconscious mind. The life and death instincts, for example, were found in the unconscious. The life instincts, sometimes known as the sexual instincts, are those that are related to survival. The death instincts include such things as thoughts of aggression, trauma, and danger. Such urges kept out of consciousness because our conscious minds often view them as unacceptable or irrational. In order to keep these urges out of awareness, Freud suggested that people often utilize a number of different defense mechanisms to prevent them from rising to awareness. How Is Unconscious Information Brought Into Awareness? There are a few different ways that information from the unconscious might be brought into conscious awareness, according to Freud. Free Association: Freud also believed that he could bring these unconscious feelings into awareness through the use of a technique called free association. He asked patients to relax and say whatever came to mind without any consideration of how trivial, irrelevant, or embarrassing it might be. By tracing these streams of thought, Freud believed he could uncover the contents of the unconscious mind where repressed desires and painful childhood memories existed. Dream Interpretation: Freud also suggested that dreams were another route to the unconscious. While information from the unconscious mind may sometimes appear in dreams, he believed that it was often in a disguised form. Dream interpretation often involves examining the literal content of a dream (known as the manifest content) to try to uncover the hidden, unconscious meaning of the dream (the latent content). Freud also believed that dreams were a form of wish fulfillment. Because these unconscious urges could not be expressed in waking life, he believed they find expression in dreams. The very idea of the existence of the unconscious has not been without controversy. A number of researchers have criticized the notion and dispute that there is actually an unconscious mind at all. More recently in the field of cognitive psychology, researchers have focused on automatic and implicit functions to describe things that were previously attributed to the unconscious. According to this approach, there are many cognitive functions that take place outside of our conscious awareness. This research may not support Freud's conceptualization of the unconscious mind, yet it does offer evidence that things that we are not aware of consciously may still have an influence on our behaviors. Unlike early psychoanalytic approaches to the unconscious, research within the field of cognitive psychology is driven by scientific investigations and empirical data supporting the existence of these automatic cognitive processes. While Sigmund Freud did not invent the concept of the unconscious mind, he did popularize it to the point that it is largely associated with his psychoanalytic theories. The notion of the unconscious continues to play a role in modern psychology as researchers strive to understand how the mind operates outside of conscious awareness.